But we are fortunate to have dear friends from Isreal whose kids are the same age as ours, and every year, the wonderful Havi would go into the kids’ classrooms to tell them the Hanukkah story (she didn’t pull any punches – they got the whole story of Mattathias and the Maccabees) and to prepare a feast of potato latkes, and the most delicious jelly doughnuts I’ve ever tasted, that Hanukkah special – Sufganiyot. I always tried to be the “classroom helper” on those occasions, and I miss them (just another one of those things that fall by the wayside when everyone heads off to high school, I guess). This year, I am having a great time, performing in It’s a Wonderful Life at the Arts Club Theatre (see a trailer here), the cast of which includes five terrific kid actors. Two talented brothers are playing Young George and Young Harry, and they are pretty excited about Hanukkah, which they were explaining to me in great detail, involves grandparents, cousins, presents and eating REALLY GOOD FOOD, featuring oil, to commemorate the eight days the last vessel of sanctified oil burned in the newly rededicated temple. My mouth was absolutely watering, in Pavlovian response. So I made my own Sufganiyot, this year. I used this recipe. They were remarkably easy and my kids were in heaven when they realized I was making doughnuts, Elder Son having begged for a deep fryer for years. I used strawberry freezer jam, left at room temperature for one half hour, for the filling. I was able to pour it into a hole poked into the warm, freshly sugared doughnut, using a Japanese chopstick, and a small kitchen funnel. I had fully intended them to be in the background of photographs for this week’s blog (they couldn’t be featured as this batch contained no chocolate) – but they disappeared in one afternoon. Must make another batch – this time I am going to try filling them with gianduja! 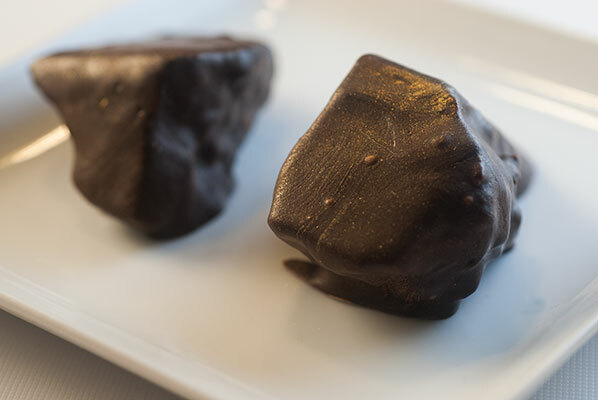 And rather than trying to deep fry a batch of truffles, I turn to another Hanukkah tradition: Chocolate Gelt. Hanukkah gelt refers to either money given as a gift on Hanukkah, or more commonly today, to a coin shaped piece of chocolate. 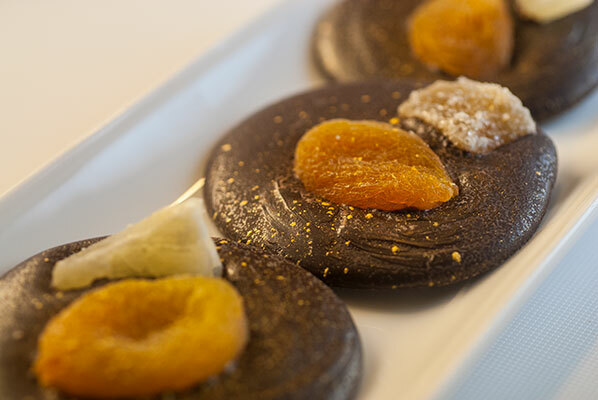 Usually the chocolate coin is wrapped in gold or silver foil and given to children in small mesh bags on Hanukkah. The word “gelt” is actually the Yiddish word for money. It’s unclear when the tradition of giving children money on Hanukkah began and there are several competing theories. The most likely source for the tradition comes from the Hebrew word for Hanukkah. Hanukkah is linguistically connected to the Hebrew word for education, hinnukh, which led many Jews to associate the holiday with Jewish learning. In late medieval Europe it became a tradition for families to give their children gelt (money) to give to the local Jewish teacher on Hanukkah as a gift to show appreciation for education. Eventually it became customary to give coins to the children as well to encourage their Jewish studies. Many families continue to give their children actual monetary “gelt” as part of their Hanukkah celebrations today. Generally children are encouraged to donate this money to a charity as an act of tzedakah to teach them about the importance of giving to those in need. In the early 20th century an American chocolatier came up with the idea of making coin shaped pieces of chocolate wrapped in gold or silver foil as Hanukkah gelt to give to children, chocolate being a more appropriate gift than money, especially for small children. 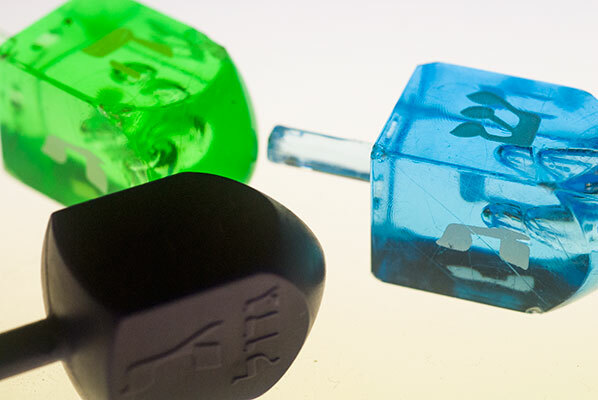 Today chocolate gelt is given to children of all ages throughout the Hanukkah celebration.When it is not eaten outright, children also use chocolate Hanukkah gelt to play dreidel. I love the image of gold, and wanted to do something fun and shiny. I have been so disappointed with the icky, low-quality chocolate coins I have eaten, found in those mesh bags from the grocery store (I think we still have some, left over from a Social Studies project on Sir Francis Drake) so I decided to temper some chocolate, and make some “bright and shiny gold things”, that the kids in the show, who are connoisseurs of fine chocolate, would appreciate. I love making mendiants, as they are just about the easiest confection to make, while still being very pretty. I poured small rounds of tempered chocolate onto my large Silpat mat, and quickly studded them with an assortment of dried fruit. You can use any combination of fruit and nuts you desire, but because these were for Hanukkah, I chose “gold coloured” fruits: dried apricots, pineapple and crystallized ginger. To make them even more golden, I dusted each piece with gold lustre dust, dipping a silicon pastry brush into the precious stuff, then flicking it over the surface of the mendicants. A little of this stuff goes a long way, as I have learned to my chagrin, when I liberally “painted” a molded chocolate with lustre dust, the results looking like a pre-schooler’s art project. These, I have to say, just shimmer and look, well, lustrous. I was so pleased with these that I thought of another golden treat which goes beautifully with chocolate: honeycomb, otherwise known as sponge toffee or sea foam. Crunchie bars are just about my favorite childhood chocolate bar, as is true apparently for a good portion of our cast. We had a long discussion about the wonderful shatter-y texture and almost sharp taste of the toffee, contrasted with the creaminess of the chocolate, in the dressing room, last week. I love making this, which is really more of a science lab than a recipe, especially since it contains the warning: “Standing back and averting face, whisk in baking soda. 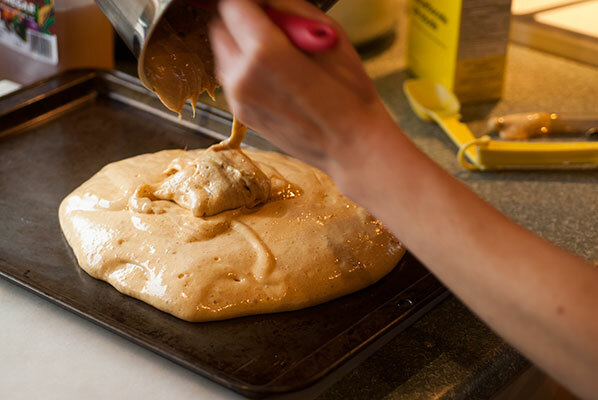 Caramel will bubble and sputter and increase in volume.” (from the Canadian Living test kitchen recipe). I altered the recipe slightly, replacing the white corn syrup with golden syrup, as I just like the taste better. It is a recipe which uses simple straight-forward ingredients, but everything is in the technique. 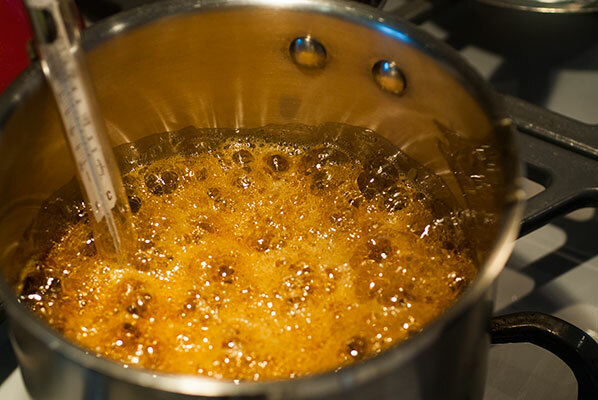 You must use a good candy thermometer, and watch the bubbling sugar mass every second. As soon as the hard crack (300 degrees Farenheit) stage is reached, the mixture must be immediately taken from the heat and the baking soda whisked lightly in, with the vanilla. Over mixing will cause the whole thing to go flat, resulting in a stiff hard mixture, instead of a light bubbly mass. 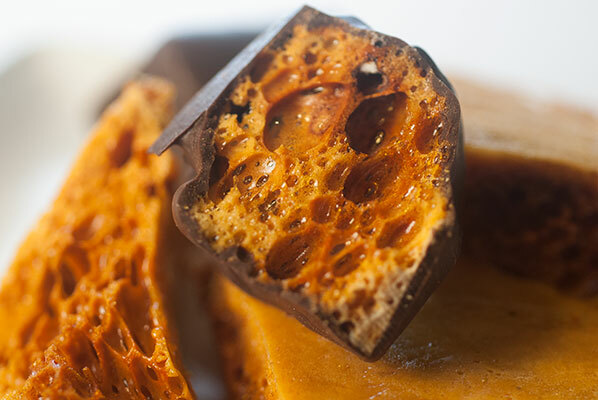 After a couple of hours, the sponge toffee is ready to break up into chunks with a knife, and it soaks up the couverture chocolate, creating gorgeous nuggets of dark brown gold. 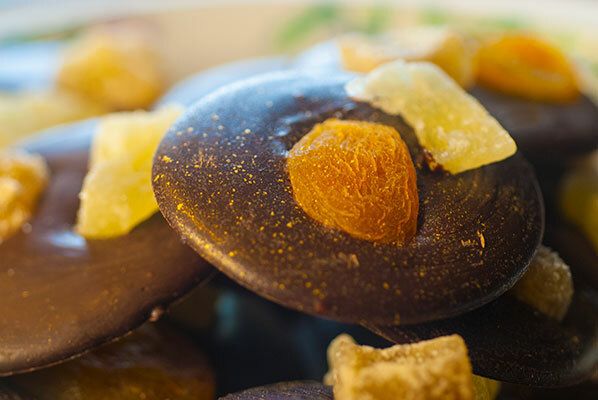 Not traditional Hanukkah gelt, perhaps, but the combination of mendiants and chocolate covered toffee make a very pretty and unusual contribution to the celebration of light.